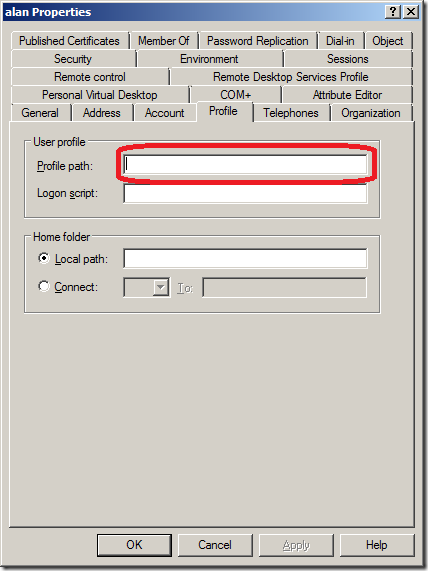 Back to another profile setting this week and this one can save any organisation using Windows Vista or greater a lot of time if you manual provision your accounts. 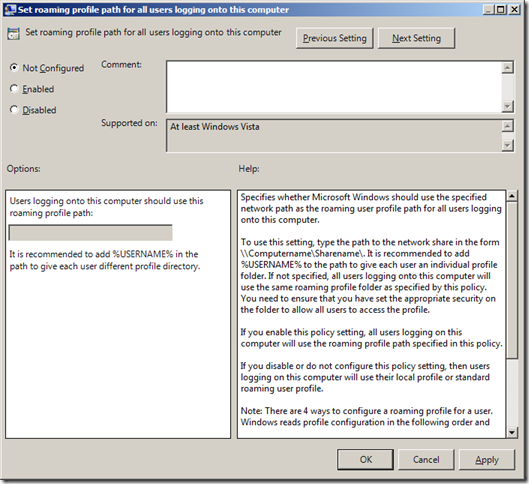 The setting is called “Set roaming profile path for all users logging onto this computer” and it configures the users roaming profile path that is normally configured on a per account basis in Active Directory Users and Computers (see below). Being able to apply this setting via Group Policy means it is one more user attribute that you no longer need to configure on the users account. This of course makes provisioning users account just that little bit simple which should save both time and the possibility for human errors. This setting can be found under Computer Configuration > Policies > Administrative Templates > System > User Profiles but as its a computer based setting this also means that you need to be careful how you apply this setting. 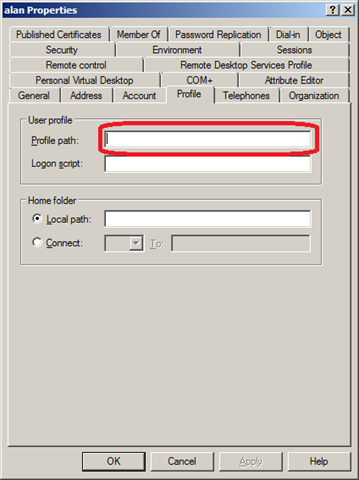 Applying this setting to laptop could be undesired as they may try to log into a remote location with a slow WAN link to the profile server. So if you do apply this to the laptop you might want to configured it to point to a DFS namespace path or a DNS alias (if you have subnet masking filtering enabled) which can help point them to a faster more local path. This of course means it would be really useful to have a OU structure that separate your laptops from your desktop computer. But I would definitely recommend use this setting if you are using Windows Vista or Windows 7 in your SOE. I am using this setting to apply a mandatory profile that is stored locally to users in an education environment. A problem I have run into is that because this setting resides in the computer portion, it is applying to ALL users, including local users. Is there any way to use this setting but to only have the local mandatory profile (in my case) apply to domain users but have local users still use a local profile? @Andrew… No… i wish it did… that would be really great… So you will need to configure this on the user account. Why on earth should this policy apply to *local* users? That just makes no sense at all. 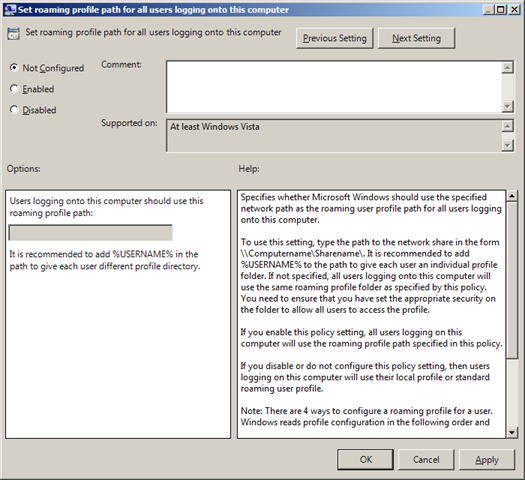 The “Set roaming profile path for all users logging onto this computer” Group Policy setting also applies to local user accounts in Windows Server 2008.
restrict the GPO scope to the computers or users you wish it to apply to?